Expat Kiwis: Expat Blog Awards 2013 - Vote for Expat Kiwis! 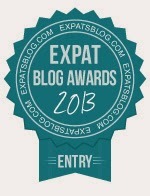 Expat Blog Awards 2013 - Vote for Expat Kiwis! We've submitted our entry for the Expat Blog Awards 2013. There are 10 prizes up for grabs and a Gold, Silver and Bronze Award for each country. Leave a comment of at least 10 words. Don't forget to like/share on Facebook and Twitter. December #worldcolours - it has been a fun year!